Quenya Forbidden - Not long after their arrival in Beleriand, rumors of the deeds of the Noldor in Aman began to spread among the Sindar. Most troubling, of course, was news of the kinslaying, the deaths of Teleri Elves at the hands of the Noldor. But the Sindar could not be sure if the story was true, or a tale spun by Morgoth in order to divide the two Elven peoples. 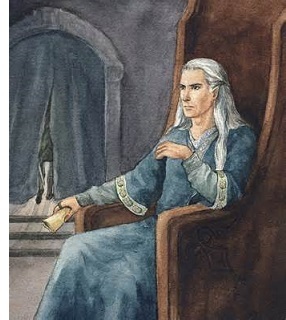 However, when at last the story was confirmed by Finarfin's son, Angrod, Thingol became enraged and issued an immediate edict, outlawing the use of Calaquendi language.